finally we are on a long voyage again! Right now it is already much cooler than a few days ago. We left behind us Fujairah, United Arabic Emirates and are on our way towards Asia! I wish the offsigned captain and ship mechanic trainee a nice vacation! It was a pleasure to meet you! Hope you made it safely home. Well, if I give greetings to some people I just will continue: Today greetings to the staff and CEO in the headquarter. Hey, shouldn’t you work rather than reading this message on my homepage? An upcoming event stirs up plenty rumors on board! Yes, my birthday is near! Something the crew plans, but they tell me not a single word about it! This week I spend some time in the provision and store rooms! Hmm, I saw tasty things there! Not only ice-cream! But most of it you know from the supermarket! My favorite room is the vegetable room with 5°C temperature! During the past weeks I survived in there very well – the crew was sweating a lot why is was chilling out there. My favorite place was a box with lemons inside! Sour makes you funny, doesn’t it? Beside the vegetable room there are other store rooms! One for meat (-20°C), one for fish (-20°C), one for potatoes (+8°C) and dry provisions (+18°C). In the dry provision room I immediately found the nutella jars! Before I finally leave cook and steward in the galley alone we take a look in the dining hall! Sorry, I have to correct myself: the messroom! We are still on board a ship! 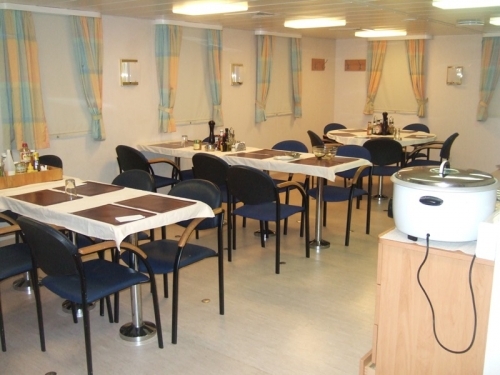 On board the Gaschem Adriatic all crew is eating in the messroom. On other ships you have two messrooms. One for the officiers and one for the crew!